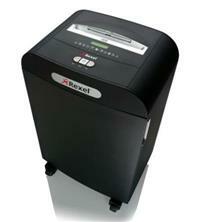 The Rexel RDS2270 is a strip-cut shredder that shreds into strips that are 5.8mm wide. It can handle up to 22 sheets of 80gsm paper at a time and it has a P-2 security rating (making it suitable for everyday, rather than confidential document shredding). This shredder can be used in a shared office of up to 20 people and the large 70 litre capacity bin means it will hold up to 600 shredded sheets at a time. Recyclable bags can also be used with it, Rexel product code 2102442. In addition to paper, the RDS2270 also shreds staples, paper clips, CDs and credit cards so offers a good range of shredding capabilities. Features include Mercury Jam-Free technology where the shredder will only shred stacks of paper within its sheet capacity limit, an intelligent automatic power-save feature that kicks in after 2 minutes non-use, auto cut-out when the bin is full (handy to ensure it doesn’t overflow) and an LED cool down indicator.